To celebrate the start of the baseball season this week, the city’s Department of Records & Information Services released a series of artifacts and historic photos for sale. 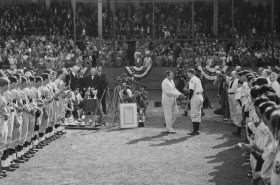 From architectural drawings of Brooklyn’s Ebbets Field to photos of Babe Ruth at the 1936 World Series, the images provide a look back at our national pastime’s origin in New York City. With baseball season back in full swing, talk at some point turns to the heartbreak of losing the Brooklyn Dodgers to Los Angeles. 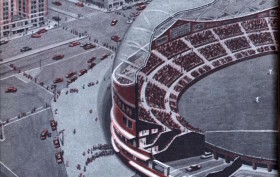 Modern Mechanix informs us that team owner Walter O’Malley had championed a Brooklyn dome stadium designed by Buckminster Fuller–and how the result is yet another reason to blame Robert Moses. O’Malley took the team to Cali, if you’ll remember, because he got a better deal on land for a stadium–better than he was able to get in the five boroughs. He had wanted to keep the team in Brooklyn, but Ebbets Field was looking down-at-the-heels by then and bad for morale. In 1955 O’Malley wrote dome-obsessed architect Buckminster Fuller requesting a domed stadium design.